Yay! Your apt. How I miss it so. I know that you think it is in need of some redecoration, and don't get me wrong, I'm psyched to see what you do, but I love the colors and brightness and happiness in your living room. So, so much. And you know how I feel about that rug. Pure amazingness. 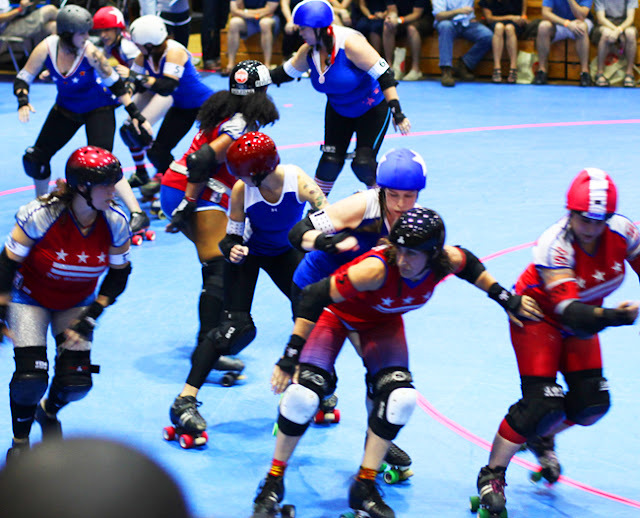 So, I'm not sure if I mentioned this to you or not, but I went to see my VERY FIRST roller derby game on Saturday night. I loved it, and I kinda want to join a roller derby league now. But I also want to become a ballerina every time I go to the ballet and a Broadway singer every time I see a play. So yeah, I'm not getting too worked up about it. But, really, it looks like so much fun! Nicknames/player names could be the most important thing about this game. Almost all of them are made up of a hilarious play on words. They definitely set the tone for the overall culture of the sport. Ellen Page's nickname is "Babe Ruthless" in the movie above, and some of my favorites from Saturday night were, well, too risque to mention. Check out Brooklyn's whole roster here. Even the ref's and medics (yes, medics, this is ROUGH, Deweese! ), have nicknames. (think "Refsputin" and "Andy Biotic") HA. 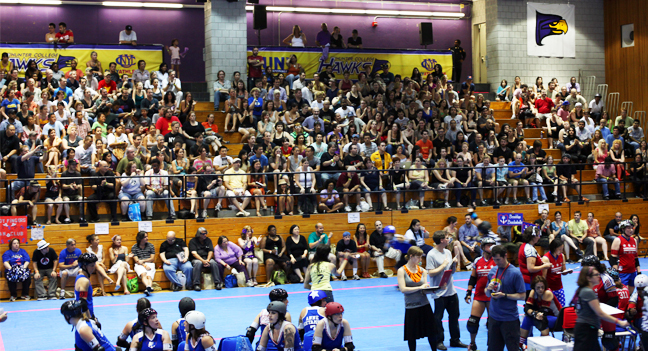 Roller derby is crazy popular. Hunter College was packed! And with tickets at $20 a pop, I was really impressed. It is a really rough sport and takes a ton of athletic ability. I was so impressed with their skating skills and the fast paced nature of this game. Talk about an awesomely fulfilling workout. The general concept of the game is easy to figure out so within 5 minutes you are SCREAMING for your team and the "lead jammer". The players are having a blast, the refs are having a blast, the coaches, the fans, the cheerleaders, and the drag queens are having a blast. I want to go again. ASAP.